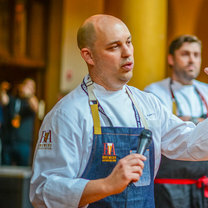 Adam Dulye is the executive chef for Brewers Association, which promote and protect small and independent American brewers, and CraftBeer.com, which celebrates the best of American craft beer. He oversees culinary side of the events SAVOR®: An American Craft Beer and Food Experience, the Farm to Table Pavilion at the Great American Beer Festival®, and the World Beer Cup®. "Take the ferry across and then walk into the bar at Farmshop. The salmon and hummus here are some of the best local fare you will find, and the ferry ride back has the best view of the Bay Bridge lights." "They may not let you leave toro until you eat one of these. The smoke and the marmalade are so addicting you'd have no problem walking down the street eating these out of a bucket with bare hands and a can of beer." "This is one of the best dishes to showcase what cooking with wood can do. A wholly comforting dish that instantly calms the craziness of SF." "When pumpkins are in season, they make a pumpkin hummus that's lightly spiced and has a nice touch of acid from the pomegranates. And they serve it with some of the thinnest, most delicate flatbread crisps around." "I start many of my days with coffee from here, and on a few days, I'll order their seasonal scone or house granola with Straus yogurt." "Avocado on toast is one of the simplest yet most relaxing ways to start a meal here."